We've heard all about what's gone wrong, but can we trust the team that rolled-out Obamacare's website to fix its problems now? Former Rep. Tom Perriello, the president of the Center of American Progress and Editor-in-chief of "Reason" magazine Nick Gillespie join Van Jones and S.E. Cupp to discuss Obamacare damage control. With Republican calls for Health and Human Services Secretary Kathleen Sebelius to step down over the troubled rollout, we want you to weigh in: Do you think Secretary Sebelius should resign over the Obamacare website problems? 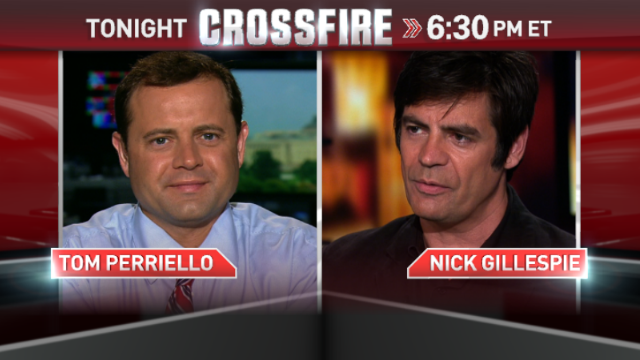 Reply now with Yes or No using #Crossfire. Vote by tweeting your response using #Crossfire or comment on our Facebook post. View results below or through our Poptip results page if you are on a mobile device. I brought up Van Jones criminal background and CNN didn't post my comment, which was basically said his opposite wouldn't be Gringrich, but David Duke!! They don't want people to know he's a Truther! The single reason the website is not working is the Supreme Court decision upholding the Affordable Care Act. I was disappointed not to hear the President explain this on Monday. To leave this cause out is to entirely misunderstand the issue. Thom Hartman is the only media reporter who has gone into the actual cause. The ACA website was intended just to be a portal to the state websites. When the SCOTUS upheld theAffordable Care Act, this fundamentally changed: the states were allowed not have state registration systems. This shifted the registration function to the federal website, which wasn't built for that. Media reporters need to start reporting the facts, and stop fanning the flames of false issues like who is to be fired. This was an artifact of a conservative SCOTUS and obstruction by Republican state opponents. If you do not report the actual facts, your stories are totally wrong, and go down blind alleys. Colorado Alpine Advanced Trauma Care Project, Inc.
again! really! Obama didn't know about it? come on how many times do you think we are going to buy this. where does he live what does he do that he is so removed from the things going on in the USA and world that he doesn't hear about it, or hears about it the way we do on the news. come on the truth would be nice. he didn't want to let the GOP win so he told them it was going to roll out knowing it was a long way off. I can not believe we send this kind of money and now to get told he didn't know is sad. is this why he doesn't talk to the GOP or any one who is he? they called Bush backward have they check Obama out. "I" have MAGIC PIXIE DUST !!! makes the economy hum right along !!! Just be sure to use "MY" MAGIC PIXIE DUST !!! Did "I" not TELL YOU that "I" am just too AWESOME !!! I'm not a Obamacare supporter, but how would Sebelius' resignation help this disaster? Tired of hearing of Kentucky having success in the sign up with ObamaCare; not even 1% of population has signed up so what is the great news. In addition, the point of Obama not knowing the severe problems is ludicrous because it's been all over the news and since he's the one that wanted it, he should have been told everything since jump street. Weak in my opinion. No, she should not be fired. Nick Gillespie, embodies the ignorance of what's wrong with this country. Instead of talking solutions you want to argue and speak over people. Shame on you! No, she should be fired. In regards to Obamacare, the administration should have hired the pros like Mark Zuckerburg and his team to do the website instead of farming it to the lowest bidder. Millions of people are on Facebook, Twitter everyday and there are no problems, but like any new site, there will be startup problems but the site should have been tested before going into effect to make sure it works especially when people have to enter personal information. Why should Sebelius resign over something that is common the software and technology world? No piece of technology, no website, is perfect at launch. There are bugs and problems you're never fully aware of until you actually launch the thing and people start messing with it. Let's ask the public: should Ms Sebelius resign, or should those members of congress who tied funding the Affordable Care Act to the debt ceiling and government funding, causing a shut down and worldwide economic angst, resign?